Nebel - "The Living Dead Girl"
ew. that is just gross to think about it. where did the eyeballs come from? ew. just...ew. 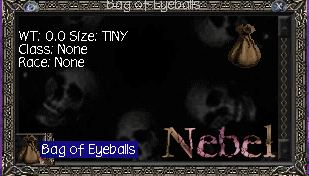 on another note, what is a bag of eyeballs for? I picked mine up off Kyv Heartpiercer in Natimbi. Still haven't found a use.